Accidentally mixing gasoline and diesel fuel - What happens then? Here's a couple of scenarios we've come across. Someone calls us at the Bell office and starts to describe a situation where they had a diesel tank and they accidentally put some gasoline into it. What should they do? We’ve also seen the converse – one of our customers accidentally put gasoline directly into one of his tractor’s diesel fuel tanks. He wanted to know if it was going to be a problem. If you deal with fuel long enough, you’re going to come across this kind of situation at least once. Mixing gas and diesel is never advisable, but isn’t necessarily a disaster. The biggest factor is how much of each you accidentally dropped in. Here’s what you might expect if it happens to you. When we talk about diesel fuel here, we’re talking about #2 diesel fuel – on-road or off-road, it doesn’t matter. When you’re trying to predict what kind of issues might arise from accidentally adding one to the other, you have to take into account the biggest differences between the two fuels. Diesel fuel is heavier than gasoline (because it’s made up of large molecules). It atomizes differently due to a different density and viscosity. And its flash point and autoignition temperatures are significantly higher. And given these, the converse can also be applied. Gasoline is lighter and flashes at a lower temperature than diesel. These differences in physical properties are what cause problems in engines and fuel systems when you put in fuel that isn't supposed to be there. Let’s say you accidentally drop a small amount of gasoline into your diesel fuel. The first thing it’s going to do is depress the flash point of the diesel, which can be dangerous given that pockets of higher concentrations of gasoline can develop in a tank. So the flash point wouldn’t be consistent throughout the entire tank. Given the large difference in flash point temperature between gas and diesel, it doesn’t take very much gasoline to depress the flash temperature significantly. As little as 1% gasoline contamination will lower the diesel flash point by 18 degrees C. This means the diesel fuel will prematurely ignite in the diesel engine, which can lead to engine damage. Gasoline contamination can also damage the fuel pump and mess up diesel injectors. This happens because of a drop in lubrication. Simply speaking, gasoline is a solvent while diesel is an oil. Diesel has enough lubricity to lubricate the fuel pumps and the injectors. Swapping in some gasoline takes away this lubrication, leading to damage. Beyond these, you’ll get incomplete combustion, initially characterized by large amounts of black smoke. Beyond being an aesthetic problem, the vehicle’s computer will try to compensate for this combustion lack by adjusting the fuel-air mixture. This is going to cut your power and performance considerably. And if you continue to use the fuel, you can cause real damage to the vehicle’s computer sensors by either overheating them or covering them in soot such that they can’t detect anything. Now, let's look at the reverse – you’re mixing a higher flash, heavier fuel into a base fuel (gasoline) that’s lighter, more volatile and burns at a much lower flash temperature. Some might think that this "diesel-in-gasoline" scenario isn't as serious as the reverse. But that's not really the case. 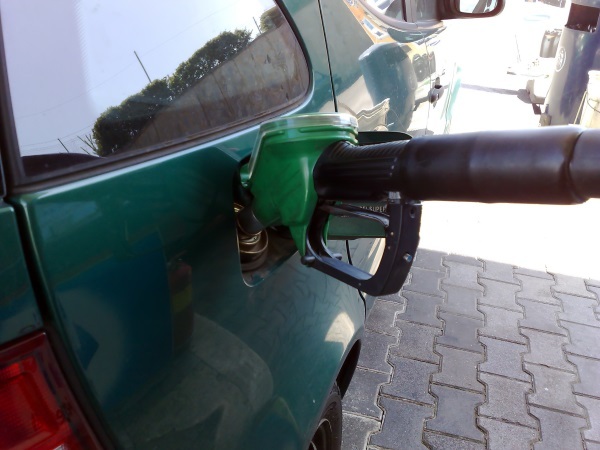 One big concern with contaminating your gasoline with diesel fuel is the reduction in octane. Thinking about how gasoline burns in an engine, octane rating is the measurement of gasoline’s ability to ignite at the right time – not too early. Gasoline with lower octane rating will ignite too quickly once it is injected into the chamber. The gasoline ignite and explodes, but the piston is still on its way up and the resulting pressure wave collision gives you (at best) a knocking sound and (at worst) damage to the piston and rod. In a sense, octane slows down combustion, it delays it. Gasoline needs to have an octane rating of 87-91 to fit today’s car engines. Diesel fuel has an octane rating of 25-40. Mixing 2% diesel fuel into gasoline will lower the overall octane rating by 1 point. Getting 10% diesel contamination lowers octane by 5 points, which is enough to create problems in most engines. The octane depression rises linearly with increasing percentages of diesel fuel in the gasoline. And that's just the first potential problem. If enough diesel fuel gets in the cylinder, you can hydro-lock the cylinders, resulting in a blown head gasket, cracked cylinder head or other serious problems that can lead your vehicle down the road to a quick and final death. This diesel fuel in the cylinder can also seep past the piston rings into the oil crankcase, diluting the lubricating oil. This can damage all internal engine lubricated parts resulting in major engine failure from rapid wear. If unburned diesel fuel makes its way into the exhaust system, it will ignite in the catalytic convertor. The fire will plug the holes in the catalyst, destroying it and leaving you with a repair job well into the four-figures. Because it's impossible to know exactly how much of the wrong kind of fuel is in your tank and fuel system, the bottom line advice is that if you have good reason to believe you (or someone else) put the wrong kind of fuel in your gasoline or diesel engine, you need to have it towed to a mechanic's garage where they can remedy the problem. Once at the gareage, they will remove all of the fuel from the filter and flush the system to remove the problem fuel. Some might respond with well, my ________ (fill in with friend, coworker, relative, general practitioner) accidently got some in his tank, and he drove it and it was just fine. In those situations, there's no way to know how your situation compares to theirs (and human nature is such that we always want to minimize our description of potential problems if it stems from a mistake that we're responsible for). If you drive the vehicle after you think the wrong fuel has been dispensed, you've been warned. We recommend that you don't take that chance in any case. Does premium gas have ethanol in it? This post was published on February 11, 2016 and was updated on December 18, 2018. How do cold flow improvers work?